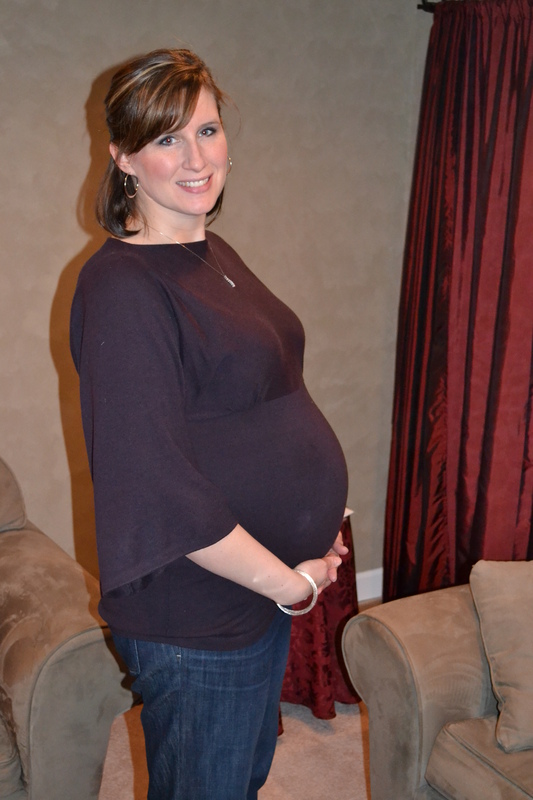 27 week update… | emmy kay and co.
Well, here we are… 27 weeks along! According to my multiples books, I am already considered 3rd trimester for having twins. Just 11 more weeks to go!! What’s new with the babies: We had an ultrasound last week and the babies are measuring about 2 1/2 weeks ahead of schedule and are in the 90th percentile for size. Whoa babies! Everything looked great – great cord attachment, placental placement, heartbeats, kidneys, bladders, etc. I am always relieved when we have an ultrasound. We have another ultrasound in a month, which is quite a treat. I guess there are a few perks to having twins. The babies are measuring about 2 1/2 lbs each and according to our friends at BabyCenter.com, they are opening and closing their eyes, sleeping in regular intervals and sucking on their fingers. In real life, these children are moving more and more. Since they are both breech, I imagine them boxing because that is how wild my stomach looks while they are moving. How I feel: The pregnancy is definitely starting to become a little bit more physically draining. It is becoming increasingly important that I get my naps on the weekends and take a day off for just resting. Other than that, I feel really good physically! I am also starting to feel increasingly concerned about getting everything done before the babies get here. From prepping their room, to making sure that the rest of the house is organized to accommodate all of the baby “stuff”, we are going to be quite busy over the next few weekends! Other thoughts: Since the babies are currently breech, and I’m not sure how likely they will be to turn, I am mentally preparing myself for a C-Section. While it would be nice to not have a C-Section, both Frank and I will just be happy to have two healthy babies, no matter how we have to get them out. If you would like, I can come over and help out with the nesting/prepping/cleaning. I’m a great organizer and can totally help. I have a lot to do myself but I’m lucky to feel 110%, have energy, and do not have to rest as much as if I were carrying twins! Good luck… these 11 weeks will fly on by! Thanks Kathy!! you are too sweet! Right now we are at a stand-still waiting for the furniture to come in. I saw you are registering – yay!! You have family and friends who will help you after they arrive. Spend these last few weeks relaxing, napping, and enjoying Frank/Em time. The rest will fall into place. Babies really need very little gear and space once they arrive, don’t let BRU fool you. A place to sleep, food, diapers, and some clothes, and you’re good to go. Sorry we’re not closer to help out in person! Denise – You will have to stop by when you are in town to meet them! you look awesome. babies “look” and sound awesome!! I CAN’T WAIT TO MEET THEM!!!!! they are quite the special little ones!!! thanks for the update and SOOOOO glad to hear you are holding up so well! you look AMAZING!